“This important book lays bare a national scandal: the shocking story of countless men of the Vietnam War era who falsify their military service. Their motives vary, from seeking unearned glory at the expense of authentic heroes, to more tangible benefits like defrauding the V.A. and stealing money from impressionable women. “Fake Warriors” enables every patriotic American who appreciates the contributions of those who serve their country honorably to identify and expose fake warriors in their midst, as well as to help bring about their long overdue punishment. We are engulfed in a national scandal. Unknown to most Americans, there is a virtual epidemic of impostors in this country — countless thousands of men (and a few women) who, since the Vietnam War, have been either inventing a non-existent military service, or inflating their war records. Veterans’ benefits amounting to hundreds of millions of dollars are being stolen. Military decorations are being falsely claimed, and often worn, by men never authorized to receive them — the kind earned the hard way by genuine war heroes. Unless something is done about these “fake warriors,” their shameless, self-aggrandizing, and costly conduct will not only continue unabated; it will grow. Anyone who thinks such conduct is merely offensive and relatively harmless is misinformed. During the research and writing of our prior nonfiction collaboration, Aid and Comfort: Jane Fonda in North Vietnam — which proves that Fonda’s 1972 propaganda trip to Hanoi would have supported an indictment for and conviction of treason — we were privileged to meet many patriotic Americans. Most of them were Vietnam veterans. Some had been Vietnam prisoners of war. They made us aware, for the first time, of the Fake Warrior phenomenon which they, and others have been courageously battling for years. 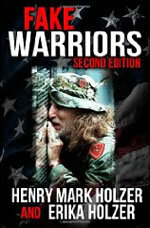 Our Fonda exposé, then, was the trigger that led to the book we have written on the subject of military "wannabes": Fake Warriors: Identifying, Exposing, and Punishing Those Who Falsify Their Military Service. The existence of so many military impostors was a shocking revelation to us — as it will be to the American public. Once we began to investigate the Fake Warrior phenomenon in this country, we found the idea of writing a book on the subject irresistible — and, once again, the Fonda book was a strong motivating force. We had learned too much about the pain and suffering endured, not only by the Vietnam POWs, but by other troops who served in that theater. Our empathy with these veterans was almost visceral. But empathy aside, the more we learned from our research on the subject, the more outraged we became. As Americans, and as lawyers, we have sustained throughout our personal and professional lives a deeply ingrained sense of justice (see www.henrymarkholzer.com and www.erikaholzer.com), and by writing Fake Warriors we had an opportunity to help correct a grievous wrong.